My pull continues as I take my second step, deep in between my opponent’s feet. The eventual success of the throw will depend largely on how deep my entry is. As I drop, I place my throwing foot safely in my opponent’s groin/hip area, just below the belt. In ju-jitsu days the foot would have been placed lower for maximum damage and effectiveness, but in judo this is not necessary. I keep my throwing leg bent until I have dran my opponent well on to the throw. 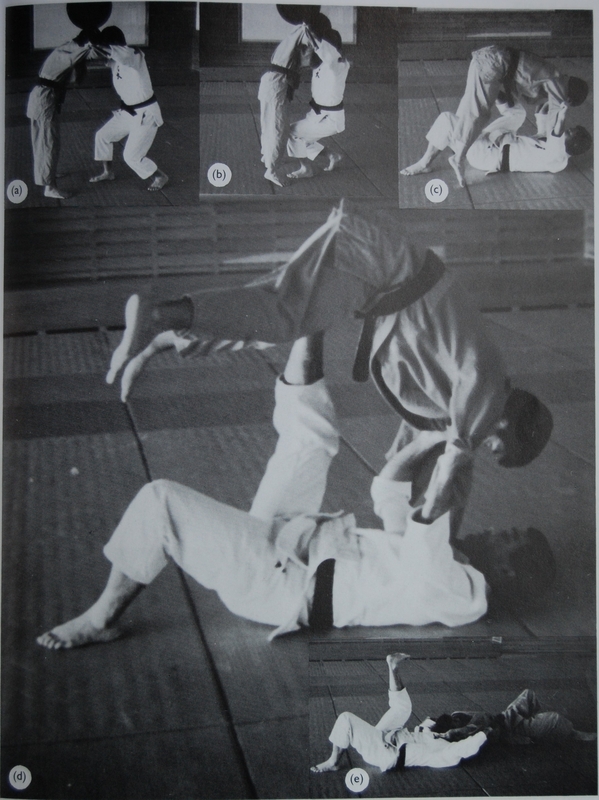 Many tomoe-nage attacks fail because the throwing leg is straightened too early. It is only when the opponent is well in the air that it is necessary to straighten the leg. Any earlier, and he is simply pushed away. To add extra impetus I pull in tight with my hands shortly before my opponent hits the mat. The images (a – e) are described in chronological order in the text. Which images each chunk of text refers to has been omitted, but can be pieced together. This covers images a through c. From here we can narrow (b) down to the attacker’s second step, the purpose of which is to get ‘deep’ in between the opponent’s feet. ‘To hoist the opponent onto his toes’ is a side-affect of the attacker’s pull, rather than the main goal which was to facilitate the beginning of the attack. If anything he is generating upward momentum (actually, more circular – as we see in later images). There is also no weight to ‘compensate for’ as both bodies prepare to move off in the same direction. If the leg stayed rigid and straight throughout the movement it would act most like a fulcrum or pivot – a point around or over which the opponent would be leveraged. Photos (d) and (e) show that the leg straightens, essentially kicking the opponent off to the rear. This movement is similar to the effect of a compressed string releasing its tension. A bow is a tightly-sprung arc, and is not really applicable to anything in the movement shown. “Of course, in competition the number of steps will most likely need to be reduced, but it is best to begin a tomoe-nage study using a two-step entry.” This suggests that the movement would be performed differently in a competition, where, we can assume, the opponent would be resisting. The technique shown in the photos is therefore not a real-life combat scenario or even close to it. The second hint (the result of which could probably be inferred anyway) is: “It is only when the opponent is well in the air that it is necessary to straighten the leg. Any earlier, and he is simply pushed away.” – this common mistake, not pictured, suggests that the throw that is pictured is technically correct. Put this all together and we get a finely choreographed movement on an unresisting opponent. The technique is explained in detail (ruling out simplistic). Furthermore, we can infer from the following sentence that the writer omitted unnecessary accessories to the technique. This leaves only B, ideal. In a perfect scenario, this is how the throw would look.